The Faithfull 778 plane is designed to cut rebates up to 38mm (11/2in) and is guided by an adjustable fence supported on two guide rods. The rods can be pushed through which allows the fence to be used on either side of the plane. A twin position cutter enhances the versatility of this plane. 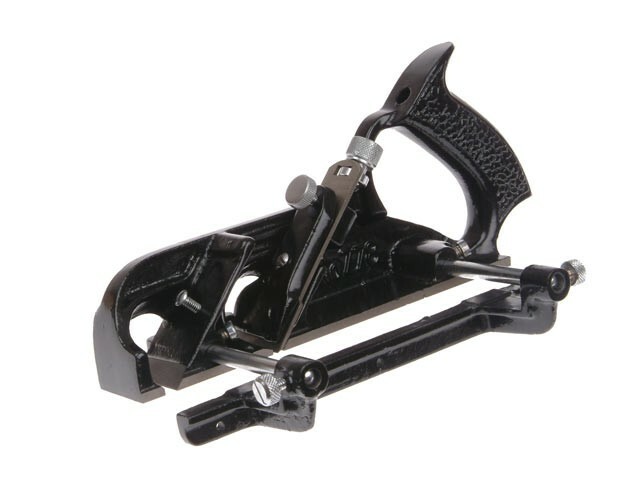 The plane features a quality cast iron body with accurately ground base, two position cutter for rebate and bull nose work, a double sided adjustable fence, a spur for cross grain cutting and is supplied with an accurate depth stop. With the cutter in the centre position, the plane can be used for cutting rebates, and has a fine screw adjuster for precise control of the depth of cut. With the cutter moved to the front position, the plane can also be used for cutting into corners (bullnose work). Presented in a hinged wooden box.